This is a very well done highlight video. The creator did a create job of syncing up the video to the music. This is the kind of stuff to watch to get you even more pumped up for the Super Bowl! 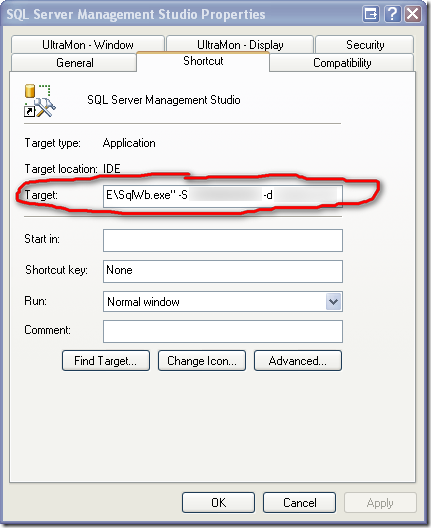 I finally got tired enough of having to click the "Connect" button at SQL Server Management Studio startup, that I decided to look for a way to bypass this prompt. Since in development, I typically am only ever dealing with the same server, the connection dialog always added an extra step to the process of getting up and running. I've come across several clever and convenient tricks for dealing with dates recently in SQL Server. I previously blogged about how to remove time from date/time stamp in SQL Server, but I've come across a group of other really useful date/time manipulations that can be very useful when dealing with SQL Server. The basic idea behind most of these tricks is that by using a known base datetime stamp, you can then use simple addition and subtraction to calculate the new dates. For example, if I calculate the difference in days between Jan 9, 2008 at 08:00 Jan 1, 2000 at 00:00, I'll end up with a whole number of days which I can then and add back to Jan 1, 2000 at 00:00 and I'll end up with Jan 9, 2008 at 00:00. Take the tricks below and play around to see what other useful combinations you can develop. If you have any other useful date/time tricks, let me know! Yesterday I wrote a blog entry talking about dynamically generating a table of dates in MSSQL 2005. My original solution involved common table expressions (CTE) and involved recursion. While there's nothing wrong with using recursion this way, I mainly was using recursion to simplify the UDF code into a single SQL expression. However, the more I started thinking about the problem last night, I decided I really needed to revise things a bit further. I decided I really needed to have the query return both a start and end date for each row in the recordset—as this would make it much easier to things such as find all the orders placed during each hour of the day. So, this morning I came in and re-wrote my query and optimized a few things. The first thing I did was remove the recursion, so this UDF should now work in SQL Server 2000 as well as SQL Server 2005. It's important to note that you could do the same thing with a physical table, but for my uses my date range table generally would only include at most a few dozen rows and there's not enough of a performance difference to warrant the pain of maintaining a table of every date and possible combination you may want to return aggregate results over. 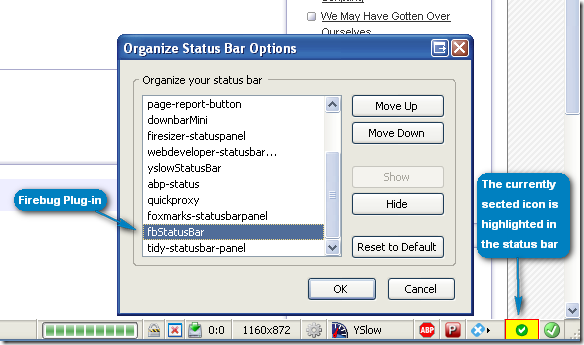 One thing that's always bothered me about Firefox, is the lack of the ability to customize the icons in the status bar. As you add various plug-ins, the order of icons in the status bar can change and isn't always ideal. Plus, when you have multiple installs of Firefox on multiple boxes, I find it disrupts my workflow when icons are in a different spot for each browser (even with the exact same plug-ins installed.) So, I decided I finally wanted to re-arrange the order of my icons and get things working in a fashion that suited me better. There are two main ways to change the order: 1) via a manual editing or 2) via another add-on. What I like about the add-on is that it highlights in yellow the currently selected icon and also has options to hide or show an icon if you don't want it to show up in the status bar. This add-on does exactly what I needed—I just wish the functionality was native to Firefox like the organizing toolbar feature. I was reading the SQL SERVER - 2008 - 2005 - Find Longest Running Query - TSQL on Pinal Dave's blog and thought I'd run the query on my development machine to see what interesting things I'd fine. I added another nullif() statement to further prevent divide by zero errors. One thing to keep in mind is that the DBCC FREEPROCCACHE will clear the cache and reset the log (obviously a reboot of the server or restart of the services would do the same thing.) You may have some maintenance scripts that might issue the DBCC FREEPROCCACHE command, so just keep this in mind when looking at the results. You can use the query above for lots of purposes. With a little refactoring, you could change the ORDER BY clause to return queries that had executed recently—which can be useful if you're trying to debug a slow running template.